X-Socks Mountain Biking Discovery socks have been specially developed to keep your feet healthy, warm and dry while out riding through sometimes unpredictable conditions. They also offer protection against skin injuries from falls, sharp thorns, rough undergrowth and whipping bushes. 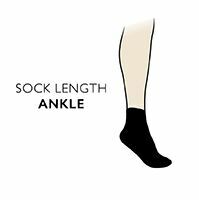 The sock cuffs self-adjust for a non-constricting, non-slipping fit. Elastic X-Cross® Bandages protects and stabilises the ankles, while still permitting full range of movement. The patented AirConditioning Channel and transverse AirFlow Channel allows air to circulate out from the shoe, so heat and moisture have no chance to build up. Integrated, and anatomically shaped to put support just where it’s required, the DryInSeconds footbed can rapidly absorb then transports away humidity from the foot. Combined with cushioning Robur, breathable Mythlan and bacteriostatic SkinNODOR, this keeps the feet fresh, bacteria and odour free. Feet and legs are protected at six points by targeted padding. X-Socks Mountain Biking Discovery Socks are perfect equipment for all-weather, all-terrain mountain biking tours.